I'll link to each of their individual reviews, plus include links to current pricing on this page. Beyond these 5 top choices, there are many different models to choose from and there can be significant differences between them. For example, some immersion circulators have more powerful motors, while others may be able to keep in a narrower temperature range. There are also brands like PolyScience, which tend to be incredibly expensive and tend to be targeted at commercial users and enthusiasts. Some have a great design but a loud motor, and some come with WiFi connectivity. So, with all of these different options, how do you choose? Well, that’s where I come in. I’ve personally tested 13 different immersion circulators, which you can read all about in the reviews across this site. Through my experiences, I’ve learned which truly are the best immersion circulators for home use and which ones are just a waste of money. In this post, we’re taking a look at my top 5 picks. These are immersion circulators that stand out from the crowd as “best” in at least one way, and are worth the investment. They are also in order, starting from my #1 choice. Which model works best for you is going to partly depend on the specifics of what you need. Some sous vide cookers may be better for your situation than others. So, let’s take a look at what immersion circulators are worth your money. All of these are models that I have personally tested and they stand out above the competition. The Joule is my #1 choice by far! 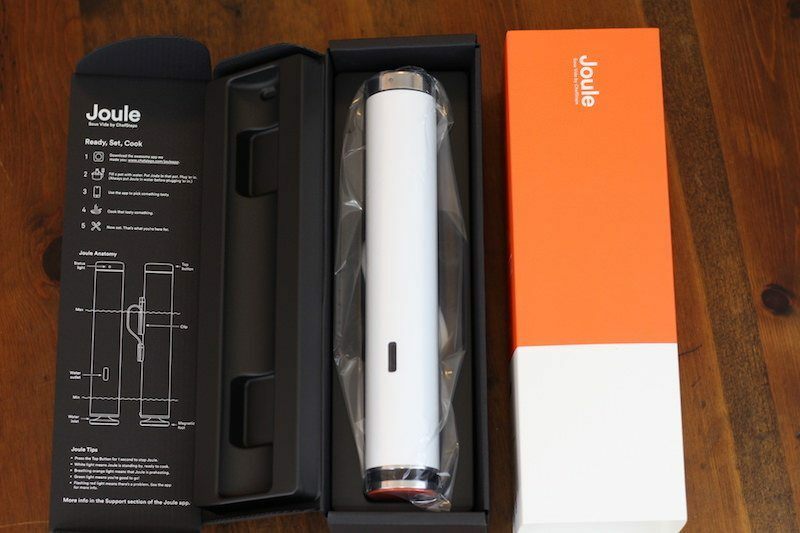 The ChefSteps Joule is an example of a company specializing in one type of device and doing so extremely well. 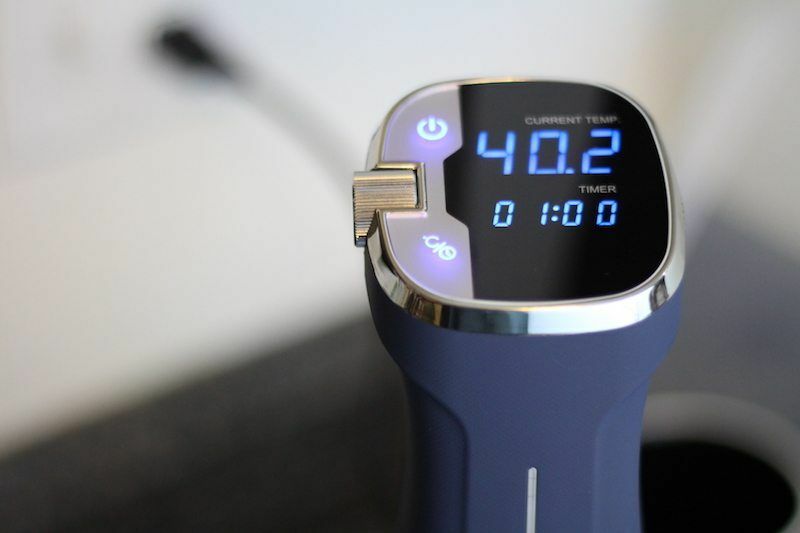 Visually, the immersion circulator looks non-tradition compared to other sous vide machines. It is smaller, lighter, and looks more like an Apple product than a cooking device. In fact, you might choose this model for appearance alone! But, despite the size, this is also one of the most powerful circulators that I’ve used. In terms of specs, the Joule offers an 1100-watt heating element and is effective for up to 10 gallons of water. It has a temperature accuracy of 0.2°F (0.1°C). That accuracy is pretty standard among immersion circulators and would be about right for most uses. The power of the Joule is nice and the machine itself consistently performs well. It also has the advantage of being quieter than most other models. That is another useful selling point because the noise of immersion circulators can sometimes be annoying, especially in a quiet house. 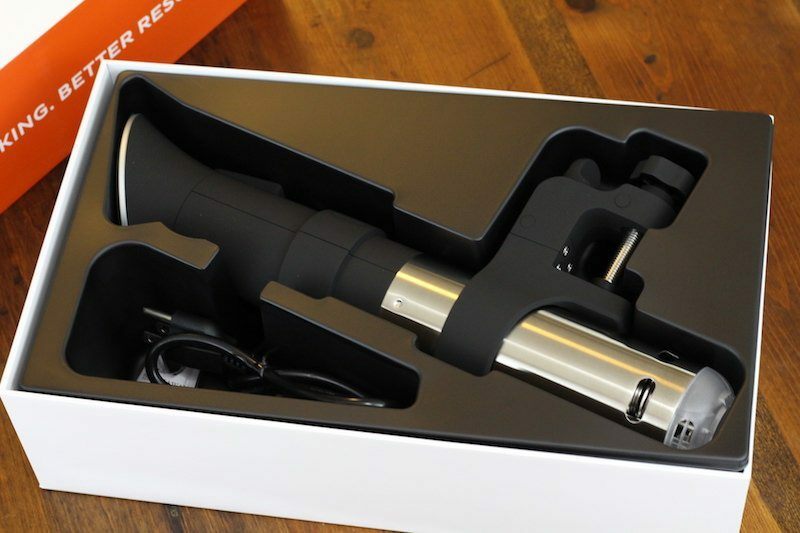 The Sous Vide App That Simple Rocks! The Joule has wifi functionality. This allows you to control the device remotely via an app. The app is not only easy to use, it's frequently updated, and actually works. 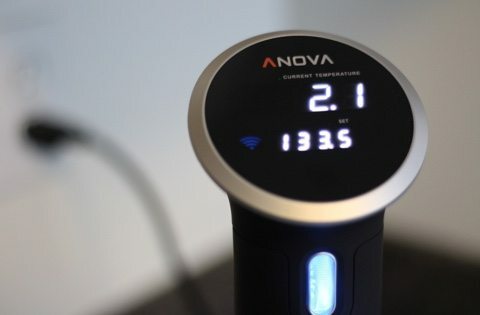 Surprisingly, many of the wifi-enabled sous vide devices I tried have not put much effort into creating a good user experience in their apps. For example, recipes are often from users and contain inaccuracies, or there are inconsistencies in recommended cook time or measurement units. ChefSteps does a great job of making both the app and the device easy to use. There is also plenty of guidance for beginners, including information on the cooking time and temperature for various types of food. This approach makes the immersion circulator useful for both beginners and experts. In fact, I still rely heavily on the app, even though my sous vide skills have improved over time. One problem to consider is that you must use the app to use the Joule. Most other app-enabled devices have a manual function, but Joule does not. One other issue is the clamp on the immersion circulator itself. It functions basically like a paper clip, and it's a little tough to pry open. You may prefer the screw-style of the Anova shown below. The Gen 2 Anova Precision is another exceptionally good choice for an immersion circulator. This is also a wifi-enabled device, although the overall style is more traditional than the ChefSteps Joule. There is also considerable hype surrounding the circulator. For example, it has more than 1,600 reviews on Amazon and the vast majority of those are positive. As with the previous model, the temperature accuracy is 0.2°F (0.1°C). However, the Anova Precision does have a heading element of 900 watts, versus 1100 for the Joule. The difference in heating element may mean that the Anova Precision isn’t as powerful. For example, I found that it took much longer to heat the water through initially. However, the significance of this would depend on how much food you were cooking at a time and what the recipe was. In my case, I was making eggs, so I ended up having to wait much longer than I wanted to. But, if you were cooking something that took 8 hours or more, the difference in time to initially heat the water wouldn’t really matter. 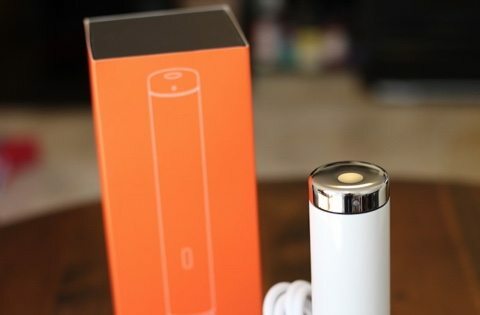 As a wifi-enabled product, this immersion circulator lets you control the device remotely and it will give you notifications on your phone if you want them as well. However, the associated app isn’t the best. In particular, the app is confusing to use and much of the information comes from the community, rather than from the company. Likewise, there simply wasn’t as much information as I would have liked. Personally, I prefer recipes and guides from experts as these are much more reliable and I feel that I can trust them more. After all, many members of the community are beginners. Still, the app does work and it would be useful for many people. Besides, you could always rely on that for controlling the device and use another app for recipes and information. Compared to the Joule, one key advantage of this model is the price. 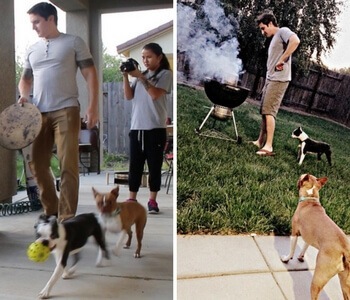 Both are still relatively expensive but the Anova Precision is around $40 cheaper. As they both have roughly the same functionality, some people may prefer to go with the less expensive option. The ability to use wifi to control your device is extremely appealing but it won’t suit everybody. And, if this doesn’t interest you, then why not pick a model that doesn’t have that functionality? One particularly powerful alternative is the Gourmia GSV140 and this is probably the best pick for anybody who doesn’t need remote control of their device. Now, this isn’t the cheapest immersion circulator on the market but most lower priced ones simply aren’t any good. In contrast, the Gourmia GSV140 is a great balance of price and functionality, while also looking good and working effectively. In fact, the model is my favorite non-wifi immersion circulator, which should tell you just how much the product has to offer. The power output of the device is 1200 watts, with an estimated 2.1 gallon per minute circulation. 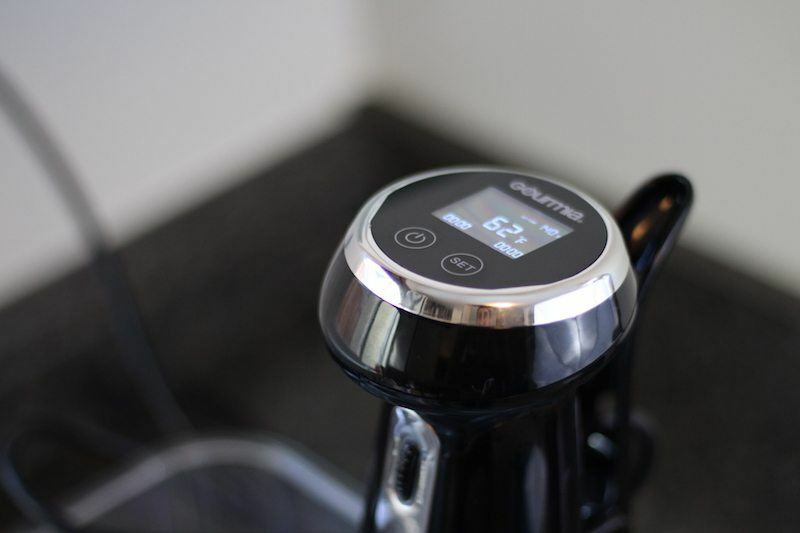 As with the ChefSteps Joule, the model is designed to go up to 10 gallons. It also has the standard 0.2°F (0.1°C) temperature accuracy. There are a few little extra features with the device that make it easier to use and you can read about those in the full review. 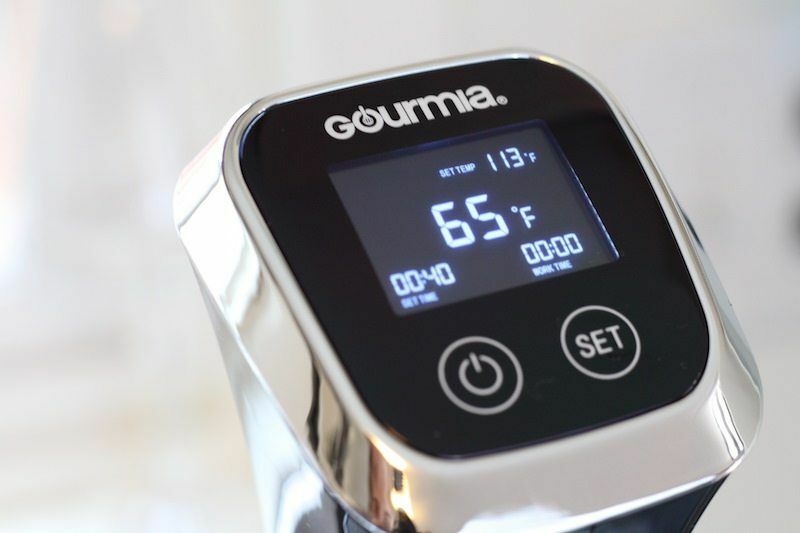 But, in general, the advantage is simply that this is a more powerful and effective immersion circulator than competing models in the same price range. Kitchen Gizmo is a fairly obscure brand that doesn’t have many other products. But, that doesn’t stop this from being an interesting choice for an immersion circulator. The key reason for recommending this model is simply the design. Most immersion circulators tend to look fairly similar to one another, typically black and industrial. But, the option from Kitchen Gizmo is more visually appealing than others and there are even multiple colors to choose from. As for performance, the immersion circulator is fairly similar to other devices in the same price range. It does also have the standard 0.2°F (0.1°C) precision and the pump circulates at around 2.1 gallons per minute. In terms of specs, the main limitation is that the power is just 800 watts, which is lower than every other item in this list. Additionally, the design doesn’t work well for shallow vessels, although it does have a flat bottom, so you could stand it up rather than using side clamps. Still, as I mentioned earlier, a lower power isn’t always going to have a dramatic effect. This is particularly true if you tend to use a relatively small container of water or if you are only cooking for one or two people. My own experience of the device was largely positive and it is certainly a good one to consider. While this isn’t my favorite immersion circulator, the product is better than most. It may also be an interesting choice if the appearance of the device matters to you. Finally, this is an inexpensive option and that may be another reason to go for this particular device. After all, if you don’t want extra features, a product like this may be all that you need. As the name may suggest, the Gourmia GSV130 is fairly similar to the GSV140 from before. This model is basically a step down from the GSV140 and is an older model overall. The visual style is a little different as well, although that isn’t likely to make a major difference to cooking. The differences between the various models from Gourmia aren’t dramatic. In particular, the GSV130 still has the same 1200 watts of power, although it is only effective for up to 5 gallons of water (versus 10 gallons for the GSV140). The motor isn’t as strong and the pump circulation is only 1.5 gallons per minute. But, the difference wouldn’t even be noticeable for smaller containers of water. However, because this is an older model, the price tends to be lower than the GSV140. There is variation over time in both cases (as there is for most products). But, generally speaking, you’re likely to be able to get the GSV130 for a lower price and discounts are more common for this model as well. The price difference alone may be a reason to consider this immersion circulator, especially if you do find a good discount on it. Have you tried any of the immersion circulators above? Even two years after writing this review, my rankings and thoughts are still the same! In my opinion, the Joule is simply the best immersion circulator across the board, in all categories. You’ve gone into a lot of detail and painstakingly gone through all of the options out there. I really love to cook, every week I try something new and are open to all the possibilities out there. Unfortunately, for the life of me, I can’t figure out what a Immersion circulator is. Perhaps you could help me out here. I liked your site where you have discussed on variety of immerssion circulators. I never knew there were so many brands available in the market.I think this instrument is more useful for house wifes who lack time to make food and also for professionals in cooking world like chefs etc,Which is the cheapest place to buy one can you suggest. I always get mine from Amazon, since they have prime shipping, which is fast and free! I also get 5% rewards by using my Amazon Prime Visa card. Wow who knew there were so many immersion circulators, what a wonderful job of breaking them down, really help’s with the decision process. Oh and let’s not forget the recipe’s, some sound wonderful and must try. How often does one use an immersion? Seem’s that I have a couple time’s, but is it more recipe specific? Hi Nathaniel. I have been looking at immersion circulators for a while now after your review on the Joule and found out it is really a nice addition to my cooking. I really liked the criteria you have chosen to compare and thus make it really easy to understand. I very much appreciate the detail. Because I rarely use an immersion circulator (because I have to borrow one), you have narrowed my choice to one that I think will be more than useful in my home kitchen. Am I mistaken, or are the 5 and 10 gallon capacity circulators more for commercial use? I now need to do some research on the recipes I really want to try to make sure that I shouldn’t look into the larger capacity circulators. I’m not worried so much with how long it takes to heat, but it’s important that the temp remains consistent. You have guided me in the right direction. Thank you!! I see you are really a pro when it comes to immersion circulators as you have tried 13 of them 🙂 So that gives you a lot of experience and knowledge to determine the best one and help other to understand what to pay attention to when shopping for this device. It seems to me that ChefSteps Joule could be the right one for me as you have described all the advantages of this one. But what happens if my phone discharges? Does ChefSteps Joule continue to operate? is it possible to connect several phones to Joule? That’s a great, knowledgeable, and detailed review for immersion circulators. The fact that the things even come with WiFi just blows my mind. I have a very old one with no heating element, no temp display and definitely no WiFi. It actually my husband’s, he had it since before we married, like 135 years ago. LOL. So needless to say the thing is old and not very impressive. Reading this review makes me want to go all the way and get the new kitchen device. And here I thought I had pretty much everything a housewife might need and want in her kitchen. Thanks for widening my horizon and for the reviews! I really love to cook and I’m glad I’ve come across your site. This seems really interesting.. but.. I don’t know what an immersion circulator is. You’ve gone into so much detail of the different kinds of devices but I still have no idea what it does. Looks like something really useful though! Hey Nathaniel, as an ex-sous chef I truly LOVE the amount of detail you go into here! It’s amazing because I always thought Kitchen Aid and Cuisineart made the best kitchen gizmos…. so I am really refreshed to read your page and find out about all the other options out there. What do you think is the best immersion blender in the 50-100 dollar range? I love making blended soups. People who make chunky soups have never used an immersion blender and don’t know what they’re missing out on! Thanks for the fantastic website and article. Though I am not a big chef, I like cooking and even have some hi-tech tools. But I never heard about Immersion Circulators for cooking needs. Need to dive deeper and read your great blog for more information. It is kind of Internet of Things as can be operated online WiFi and so on. Cool! Having never tried sous vide cooking before, it’s nice to see such thorough reviews of the equipment on this site. As you may have surmised from my email address, I am a baby boomer, which means I have not grown up using kitchen gadgets that are wifi enabled. However, I am very intrigued by this stuff in my old age. Gourmia GSV130 when I’m ready to pull the trigger on as immersion circulator. I really enjoyed reading all your reviews. I’ll bet you had a blast trying out all 13 models. Just try not to put on too much weight! I like to cook at home but have never heard the concept of immersion circulators. Thanks for the in-depth review, you really gave me a new point to learn. My question was whether the start cook would recommend investing money and buying the best that there was or would recommend buying the most simple and assume that he would also do a great job? I think you did a great job explaining the differences between all the different immersion circulators. I do a lot of cooking and have wanted one of these for a long time. The ChefSteps Joule sounds like a great option for me seeing I am the one that cooks for family functions. I did not know there were so many choices so thank you for you review of the top 5, now I can narrow my choice. I’ve started to cook more and more at home. I’ve been trying to learn as much as possible, your article on immersion circulators definitely caught my eye. I will be taking a look at your individual product reviews to gain a further understand . Do you test out each one yourself or is this more from research ? I was jubilant to see that we have the same criteria when we choose picks? I think that even so, the design is important, it has to much effort for some people. About Gourmia GSV130. Is this not an excellent example of that you don´t always need the newest when the difference are not much between newest and second newest models? What I have in mind is that if the difference is not very much, the difference in price made it worth to buy the second last model? Wow!! Great information on immersion circulation, I didn’t realize there were so many to choose from, now I do, thanks to you. Few suggestion I have that might make the page more ingestible. 1. Briefly describe what a immersion circulation is and why it is used.. I saw a reference to some recipe I don’t know. 3. Point 2. make sense as you already have a detailed review link for each of them. I truly love to cook and I’m happy I’ve gone over your site. This appears to be truly intriguing.. in any case.. I don’t comprehend what a submersion circulator is. You’ve broadly expounded of the various types of gadgets yet despite everything I have no clue what it does. It would appear that something truly helpful however! Very in-depth article. I’m impressed that you’ve personally tested out 13 different immersion circulators. I love to cook myself and have always wanted to try the sous vide cooking method but never wanted to spend the money on expensive equipment. But after reading your article I have checked out some of your recommendations on Amazon and the prices are rather affordable. So thanks! I was just looking for more info about Kitchen Gizmo and you gave me so many other products I can compare with!! Thank you so much for sharing all these little details I was looking for. Thanks for the great review! It’s super insightful with tons of good info! you really did your research! Definitely worth the read. The photos were a great addition as well, it was nice to see the product and packaging. Fantastic! Do you have any recipes that use your favorite Immersion Circulators? I had never before heard of an immersion circulator before stumbling upon this read. Thanks for enlightening me and now I am sold! I think that I’ll go for the more affordable route for now, especially since I am not an enthusiast just yet. But this is definitely a must have so I can continue my ongoing journey toward better food, wellness and practicality! Thanks for the help Nathaniell ! Come back soon when this list is updated. I’m testing a couple more this year! Oh, and I just saw that the Joule reduced their price, so they are even more competitive compared to other “premium” immersion circulator choices. It looks like the competition is heating up to be the best of the best in the sous vide kitchen. Excellent post here! I love to cook and blogs like this are always great for people like me looking for new and innovative tech to incorporate into our cooking lifestyle. Thanks for introducing me to immersion circulators, these are some really cool devices that I might have to try one day. Awesome post and I look forward to reading more! I bet you make some fingerlickin good BBQ ribs, don’t you? You should sell your sauces online if you are not already doing it. The sauces at the stores are usually pretty good, but there is no substitute for the real authentic tastes that you can prepare. The pictures of the food look amazing. I’ll keep watching for your recipes. Design, Extra Features (apps, cookbooks, etc). Are those in any particular order. Such as did you favor price more heavily as when compared to extra features? I am just wondering off the top of my head here. But I love your article. I found it to be very good reading as to being a list of the best immersion circulations for home cooking. I don’t have any particular order, but I guess i do emphasize Price VS Function as my main criteria for recommendation and rating. This is of course a little subjective! I have honestly never heard of cooking by Immersion Circulators and after looking at your website I am still not to sure what they are. I like the way you personally reviewed 13 of them and gave them a rating but unless I missed it I never read exactly how one cooks your food. This may have to do with my antivirus on my computer would not let me open up some of your blogs saying it was an unsafe website. I am not a computer genius but I didn’t want to take a chance and allow it and get a virus on my computer. So I honestly did not get a chance to really browse thru it like I wanted to. There are also a lot of pop up ads which I understand why you have them but they can get annoying when trying to read something. I did not see anywhere on your site about you. I honestly could have missed it. Immersion Circulating cooking looks like a very healthy way of cooking and I am into healthy eating!! Wow, you learn something new everyday, and today, I’ve learned about immersion circulators – so fascinating! Your review of a variety would definitely be useful for someone like me ready to buy once ready, and now that I know what they are, I would definitely consider getting one for my kitchen. Thank you for a detailed listing and information. 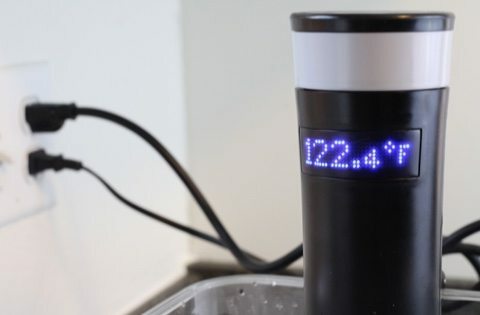 That’s quite an eye opening article about sous vide cooking and factors to consider when shopping for immersion circulators. I agree with you that price would be a big factor for anyone. If I would ask, what would you recommend for a 50- student hospitality college if one was on a tight budget? Would sous vide cooking as a course also be a priority course to consider when starting such a college? Wow…I had no idea there were that many immersion circulators out there..I have seen my parents cook with one but had to idea what they were for. Great read and content, also love the shrimp section, one of my fav. Ingredients either as a main dish or on the side.thanks for the quality site. Lol! I also didn’t know what a immersion circulator was. However, a quick google search and Wiki told me what it was. It turns out I have used this method of cooking before – I just didn’t know it’s name. I made an awesome recipe I found on a professional chef blog for lemon curd. I was quite skeptical as all the ingredients – including the whole eggs got put in a bag, was sealed and simmered at a stable temperature. Then after an hour or so, it all got blended together and it was so delicious on toast! I can now see how one of these immersion circulators could help to keep the temperature at the right level. I think you have done a great job reviewing the 5 products! There are many delicious dessert recipes for sous vide!